Don't think of it as an invented, capitalistic holiday that preys on the in-love and lonely --- think of it as another opportunity to support local artists, designers, printers, makers and chefs! New line of Valentines featuring lyrics from some of the masters of talking about love: Bowie, Benatar, Prince, Gershwin, Dire Straits and U2. Head to our store to check them out! 1st phase of cutting to remove all that will be white on the final print. Phase 3 cut and ink of all that will remain printed in medium blue. what remains un-inked will next be printed over with black so i chose to leave it un-inked in this phase. Phase 4 inking - i placed paper over parts of the plate that were hitting the paper that i did not want to be printed--this photo was taken after a print was pulled showing that ink from the previous layer (med. blue) rubbed off onto the plate area. i would switch out the paper for each print to keep all clean. I spent a chunk of time in Mexico City during the summer of 1994 working on an art installation with friends and feeling out how it could be to carve out one's life outside the US. The D.F. was the most cosmopolitan city I had visited at the time. My closest friends were from Germany, Argentina, Canada and Mexico. The city turned my expectations on their heads and provided me with an overwhelming influx of people, art, making, and adventures. It was at a time when the US National Endowment for the Arts was threatened with collapse and funding in Mexico was overflowing to any and all. It was well before the present day feelings of Mexico as an unsafe place and at when it seemed the worst thing that could happen to you was being whistled at rudely on the street. We stayed safe. We felt free. And our huge rooftop apartment in the Doctores neighborhood was only about $400 a month. I shot film. I had no cell phone. My Spanish-speaking was the best it has ever been. Days consisted of sleeping in, shopping at the nearby vegetable and fruit market, a liquado from the stand on the corner, languorous breakfast preparing and rooftop lounging, heading out into the city to work on the project, dinner out or cooking on the rooftop, then out to bars, shows, galleries, parties, etc....Repeat. A side-project of the installation was creating all of the press materials and propaganda for the opening. We silk-screened stickers, plastered ads on alley walls and had posters letterpress printed by a shop that specialized almost exclusively in lucha libre posters. It was here that I had a resurgence of my love of type, ink and making. I have forgotten the name of the shop, but it was a treasure trove of type, large format presses and straightforward print for the masses. It was beautiful, and messy--and I loved it. Type stored in piles. Ink scooped onto presses by the cup-full. The clicking and whirring of giant machines. And the result--posters, propaganda, information, instruction, knowledge...for the people. 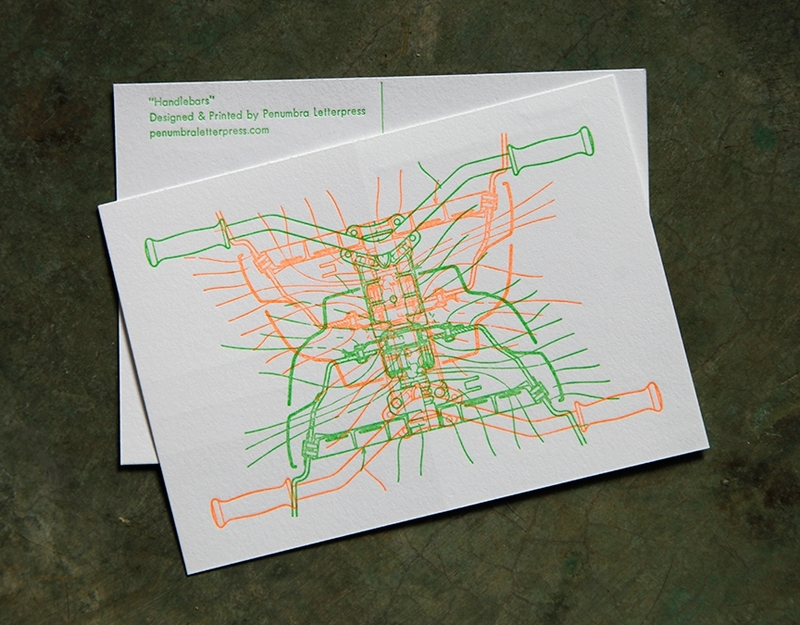 Handlebars: First print with the new fluorescent oil inks from #inkintubes. I just might be a convert. Thanks Chris Fritton (#theitinerantprinter) for introducing me to the fluoros! If you are a small shop like me, or just prefer to buy inks in smaller quantities, I highly recommend Ink In Tubes....especially for oil inks, the sealable tubes equal less waste and less ink drying out. 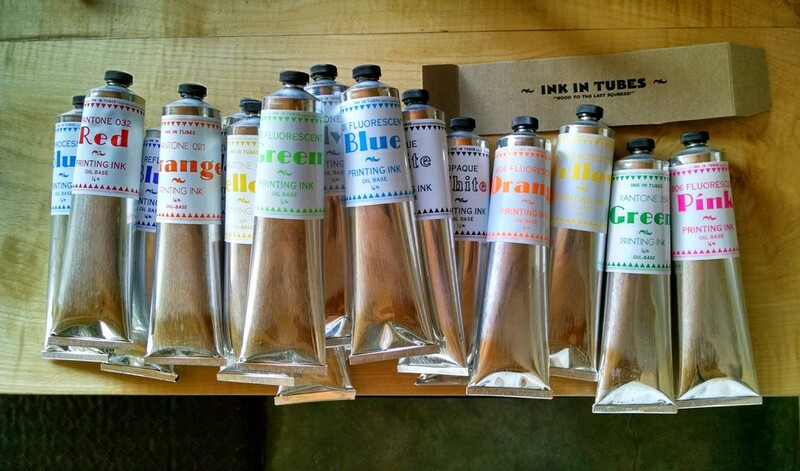 Dave Robison at Ink In Tubes has a slick operation selling oil and rubber inks in 1/4 pound tubes. He offers pre-mixed colors, all the Pantone staples you like to mix with, metallics and fluorescents. Contact Dave for more info: ink@orchidesign.com. See the Ink In Tubes ink list/order form here. Linoleum cut and Lead Type. Snail Mail Love from Penumbra, coming to a mailbox near you--soon. Chris Fritton, the Itinerant Printer, will be making a stop at Penumbra Letterpress as part of his coast-to-coast letterpress printing tour. He is visiting shops around the country and producing a postcard at each shop using on-hand lead, wood and photopolymer plates. Penumbra Letterpress will be hosting a Print + Hang afternoon at our shop on June 7th at 3:00pm. Come meet Chris, learn a little, watch a master in action, do some printing and sip some bourbon as the Penumbra Letterpress edition postcard gets its final touches. Email Penumbra Letterpress with questions or for directions. Learn more about The Itinerant Printer Project here. Working with a slick line art and text based design from Lacey Adams Design in Santa Fe, we printed up a 2 color, 2 sided informational and promotional card for MAKE Santa Fe. Printed on brown chipboard, this card extends the feel of handmade that the future maker's space wanted to convey. We printed two different color options to match the existing collateral of MAKE Santa Fe. This brought up the challenges of printing with a lighter ink on chip board. The light green version held up, but the deep red was an easy, effortless press run that showed the strength of the more ideal contrast choice. Thanks to Lacey for her time spent helping me put this run of 500 cards through the 4-run print process, and to Nichole for the beer reinforcements. Cheers to MAKE Santa Fe in their efforts to get this great maker's space opened up and to their counterpart in Taos, The Toolbox. After several months in LA LA land. I am back in the mountains in the fresh air and back in the shop. Stoking the wood stove and getting the ink running is like riding a bike. So GOOD to be back. Incredible, tedious, intelligent, gorgeous, BOOKS...handmade by a lovely fellow in Stockholm, WI--a stone's throw from where I grew up, across the river in Minnesota. The shop will be on hiatus from Oct 2014 until Feb 2015. All inquiries are welcome, but projects will not resume until Feb. Thank you! Fritz took several hours out of his day to show us his shop, his store, his supply of press parts, his cats, his incredible collections of typefaces, his file cabinets of the last remaining Vandercook blueprints, the many original files from the American Type Founders that he acquired when they closed and the shop at his home that is still under construction and houses several incredible specimens including one of the last remaining, functioning Linotype machines. In addition to being an accomplished pressman and advocate for the analog before analog was even cool, he is also a historical restoration king--he is responsible for returning many buildings in Telluride, Silverton and locales around Colorado back to their original glory. Truly a living-legend. Erica and I wanted to adopt him and take him home. LETTERPRESS NERDS UNITE: We did a small soup-up to the Chandler & Price today. The old C&P was missing a spring loaded bolt to connect a piece of stabilizing hardware (the Rocker Lock) so we built our own from basic hardware store parts. We had a photo of the original part and some basic measurements to work from thanks to Mike from Long Day Press. After a little coaxing and grease (ahem) she was purring like a 128 year old kitten. Success.